Originally published by The Pacific Coast Khalsa Diwan Societ, INC. I. Woman's Position in India. Is She Bond or Free? VIII. Why is India Poor? This work was undertaken at the request of THE PACIFIC COAST KHALSA DIWAN SOCIETY, commonly known as the SIKH TEMPLE at Stockton, California. 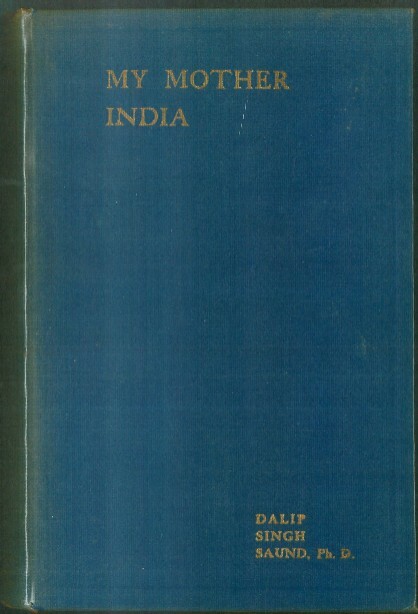 The original plan was to write a comprehensive reply to Katherine Mayo's book MOTHER INDIA, which was changed later to one of producing a handbook on India for general use by the American public. In view of the momentous changes of world-wide interest, which have taken place in India during recent years, the need for such a book was quite imminent. And it was only fitting that THE PACIFIC COAST KHALSA DIWAN SOCIETY, in its role as the interpreter of Hindu culture and civilization to America, should undertake its publication. Only a few years ago, India, like other countries of the Orient, was a far Eastern problem. Today, if rightly judged, it has already become a near Western issue. Except for the few scholars of oriental history and literature, who occupied themselves diligently in exploring the hidden treasures of Hindu civilization, the name of India was an unknown thing to the rest of the American world. For the average man and woman in the United States the affairs of that oriental country were too remote an issue for them to notice. With the advances made by science during recent times, however, different parts of the world have become so near together, and their business and cultural relations have grown so desperately interlaced, that the affairs of one section of the globe cannot, and should not, remain a matter of comfortable unconcern for the other. It has been my aim in the preparation of this book to answer the various questions that commonly arise in the minds of the American people regarding the cultural and political problems of India. And if I have succeeded in bringing about a better understanding of India by the people of America, I consider myself amply repaid. Wherever feasible I have made free uses of striking passages and phrases from the writings of several authors. Since these were copied from my notes gathered during a course of study extending over several years, it has not always been possible for me to trace the source, for which I wish to be humbly excused. I wish to express my sincerest appreciation to my beloved wife for her untiring assistance in the preparation of the manuscript and the reading of the proofs. I wish also to thank my friend Mr. Anoop Singh Dhillon for valuable suggestions.